The Health Benefits of Cumin is amazing, from weight loss to lowering blood sugar to fighting cancer. High in Iron, copper, and magnesium. Cumin is a member of the parsley family along with caraway, parsley, and dill. There are two main types used; Black and green seeds, both of which are not only nutritious when used as a spice in many culinary dishes around the world. Cumin has a history going back beyond the early days. It has also been mentioned in the Bible, both the Old and New Testament. Highly favoured as a spice, it is included in many Indian and Mexican dishes and is an active ingredient in chilli and curry powders. However, more so are the health benefits, some of which have been already been mentioned above. 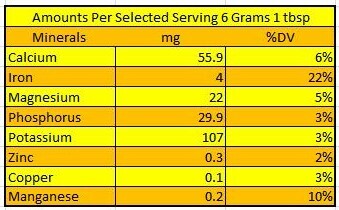 Cumin is very high in Iron; in fact, as you can see in the chart below just one tablespoon (6 grams) has 22% of the Daily Recommend Value. Cumin is super rich in iron, which is essential in the formation of haemoglobin in the blood cells. By including Cumin in your health regime it will help to maintain the blood levels at an optimal level and can help those who may suffer from anaemia. Because Iron is lost during menstruation, having some cumin preferably before the monthly cycle start can help to reduce the iron loss during this time. For those who suffer from very heavy periods tend to feel weaker due to the blood loss and lower iron levels. Again, regular consumption can help to reduce iron loss and thus may help avoid those dizzy and weaker times. The antioxidant property within Cumin helps to stimulate the secretions of bile within the liver that can help rid the body of toxins through elimination, via either sweating or elimination of urine. Adding the spice to your foods or as a tonic by adding cumin to water and drinking this regularly can help with flushing out the toxins from your body. Cumin has powerful anti-oxidant properties that work by removing free radicals known to damage oxygen based cells. We know how great Cumin can be a spice when used in culinary foods. However, when you extract the essential oil from Cumin then you open up a new world of much more powerful health benefits of Cumin compared to the powder. Found within the oil are many properties that are important to your health. These properties are antibacterial, antioxidant, antiseptic, antibacterial, and carminative, digestive. The Green cumin seed or powder is the spice mainly used in culinary cooking. The Black Cumin seed is more widely used as an essential oil. Cumin has antibacterial and antiseptic properties, which are able to treat skin conditions, caused by some form of bacterial infection. Such as Acne and can be used as a great tonic to tone up the health and appearance of the skin. 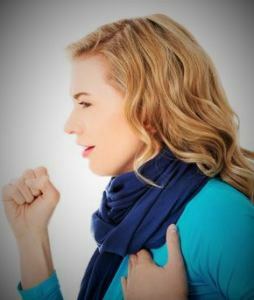 The expectorant properties found within the Black Seed Oil along with its antimicrobial qualities work well in breaking up built up mucus that may create the congestion and other breathing issues, which may be the result of having a cold, flu, or bronchitis. When used in a steam inhaler, asthma sufferers could very well benefit from the black seed oil as well as it helps to clear build-up congestion in the respiratory tract. 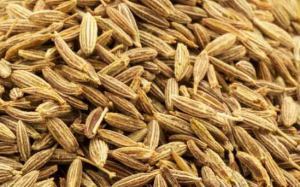 We know that Cumin helps with the stimulation of the enzymes of the liver. Another action is that it helps to stimulate the saliva glands, which aids in the secretion of the mouth’s saliva. This action helps the breakdown of food entering the stomach along with aiding better digestion by the production of gastric juices and bile, which are necessary for easier elimination of waste from the intestines. Black Seed Essential oil has carminative and antispasmodic actions that can also help the abdominal pain, cramping and bloating that women would confront during their menstruation monthly cycle. Drinking warm Cumin Tea can be another way to help with such pain. Cumin oil is beneficial to help calm and relax the nerves helping to reduce anxiety and stress one may face in life. You could also add some drops into a bath or even add the drops to a vaporizer that can fill the room with its aroma and by breathing is vapours can help to calm one down. As with most Essential oils, when applied directly to the skin some may experience a skin reaction such as a mild rash. It is always best to dilute essential oils with some type of carrier oil such as Almond or olive oil for example. Once blended, massage the oils into the skin. This action will help to increase the flow of blood to your muscles and surface of the skin. 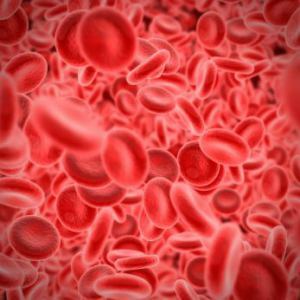 This action of bringing the blood to the surface can help in quicker recovery to many issues that may relate to soreness or tiredness of the muscles and joints of the body. As mentioned above it is always best to combine any essential oil with some type of carrier oil. Due to its photosensitivity, avoid exposure of the skin to sunlight for around 24 hours after application. Pregnant women and lactating women would be best to avoid cumin essential oil. Do you have any health benefits of Cumin you wish to share? Please share with all by placing a comment below. Remember your thoughts and actions could help someone else.